And now your distant rest brings pain. Saint John the Scholastic, also known as John of Antioch, was born in Sirmis, which is near Antioch. He was educated as a jurist and practiced law before his ordination to the priesthood. He came to be known as "scholastic" or "scholastikos" due to his education as a lawyer and rhetorician, being a term for those who appeared in court or in public in some way. In 533 Emperor Justinian I (527-565) suppressed the college of lawyers in Antioch, so John was ordained to the priesthood, and became agent and secretary of the Church of Antioch. Patriarch Anastasios I of Antioch (561–571 and 593–599) sent John to Constantinople to serve as his legate there. This would bring him into touch with the court at Constantinople. When Justinian, towards the close of his life, tried to raise the sect of the Aphthartodocetae to the rank of orthodoxy in order to promote unity of his subjects, and determined to expel Patriarch Eutychios of Constantinople (552-565) for his opposition, the able lawyer-ecclesiastic of Antioch, who had already distinguished himself by his great edition of the canons, was chosen to carry out the imperial will. Therefore Eutychios was exiled to Amaseia, and John was elevated to the patriarchal throne on April 12, 565. Before John was elevated to the ecumenical patriarchate, he compiled a collection of canons better than all the previous ones. He is credited for the methodical classification of Canon Law, the Digest of Canon Law. Following some older work which he mentions in his preface, he abandoned the historical plan of giving the decrees of each synod in order and arranged them on a philosophical principle, according to their matter. The older writers had sixty titles, but he reduced them to fifty. Prior to this, the decrees of the more important synods were gathered together in loose collections, such as the Codex canonum used by the Chalcedon Synod in 451. Since the fifth century, those collections had increased. With John's labors, at last final attempts were made to reorganize the solely chronological order of the canons into a systematic one. His was the first of any importance to do this. The Digest of Canon Law (Synagogy Kanonon) was compiled between the years 540 and 560. Pope Nicholas I (858-867), when writing to Saint Photios the Great, alludes to the work as Concordia canonum. 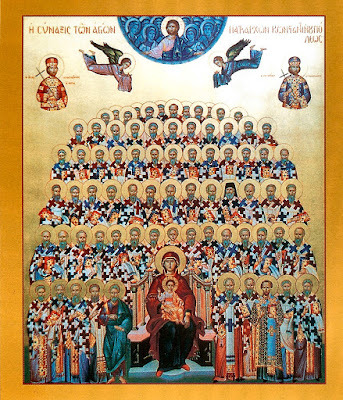 It should be noted that this was also the first attempt to collect canons from the letters of the Holy Fathers, such as those of Basil the Great. The first edition of this Nomocanon (a collection of canon laws) consisted, as we said, of fifty titles with 375 canons, but after John became patriarch he enlarged it to sixty titles because he added the 87 chapters from the Novellae of Justinian, concerning civil laws that affected ecclesiastical matters. This collection continued to increase until it was enlarged into the Nomocanon of Saint Photios. Little is known of his episcopal career. Seven months after his appointment Justinian died. The new emperor, Justin II, was crowned by the Patriarch on November 14, 565. He organized a compromise between the Chalcedonians and Non-Chalcedonians in 567, and temporarily reunited the two in 571. He is credited with adding the Cherubic Hymn (χερουβικὸς ὕμνος) and the communion hymn Your Secret Supper (τοῦ Δείπνου σου τοῦ Μυστικοῦ) into the Divine Liturgy in the year 573, though the latter hymn was originally only meant for Holy Thursday. Many important churches and monasteries in Constantinople were also built and consecrated during his time, including the beautification of Hagia Sophia and that of the Holy Apostles. In 569 the Church of the Holy Unmercenaries at the Dareiou was built, in 571 the Church of the Holy Apostles Peter and Paul at the Orphanage, and additions were made to Blachernae and Chalkoprateia in 577. After serving as patriarch for more than eleven years, John reposed in peace on August 31, 577. His predecessor, Eutychios, succeeded him when he returned from exile by Justinian's nephew, Emperor Justin II.